With this famous World's Biggest Piano Mat, you and your child will step and slide into a magical world music just like Tom Hanks did in the classic movie "Big"! This is your incredible chance to bring larger than life fun into your very own home! Kids can't get enough of this oversized toy piano as they experiment by stomping on loads of keys with realistic sounds. Featuring a whopping 6 feet of fun, the music mat doesn't only feature piano, but lets you choose from 8 different built-in instruments! This unique keyboard mat is big enough to fit multiple kids and adults, so everyone can giggle and delight in musical rapture. 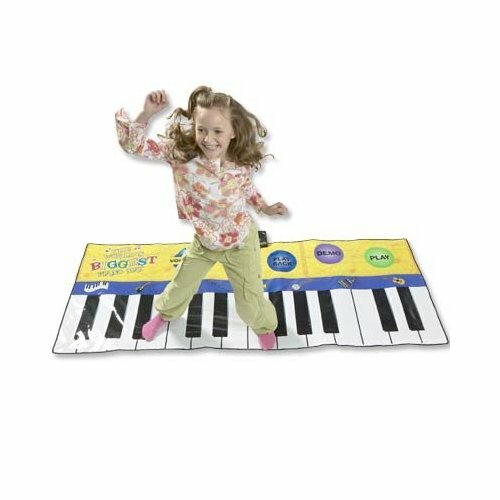 Inspire your child by giving them the world's largest Piano mat that entertains and enriches their lives! NOTE This Item Only Ships Ground and does not ship express or to PO Boxes, APO addresses, Alaska or Hawaii. Availability: This Giant Piano Mat takes approximately 1 business day to leave the warehouse plus transit time.